In general, speakers in the same price category, made by companies with reputations for making good products, will all reproduce enjoyable, musical sound. Often, you really do get what you pay for. Larger boxes, for example, are usually capable of producing deeper, richer bass. More expensive speakers are sometimes built from exotic materials, or finished with fine wood veneers rather than wrapped in synthetic simulations. But several companies realize that price is an object, and that there is a lot of competition among loudspeaker companies to make their products the right choice for discerning music listeners, particularly in the popular two-way monitor (or "bookshelf speaker") category. Axiom Audio is among the group of Canadian speaker manufacturers that grew up around the National Research Council (NRC) lab in Ottawa -- companies such as Axiom, Paradigm, PSB, and Energy are well known for making high-quality equipment that wont obliterate your budget. By doing much of their work at their in-house facility in Ontario and dealing exclusively over the Internet, Axiom is arguably able to offer a bit more of what is so often promised but is frequently elusive: added value. Technically, the VaSSallo M22 v2 falls under Axioms "bookshelf" category, the third step up from its more commonly sized two-way models, the M2 and M3. The standard M22 v2 is priced at $460 USD per pair; the VaSSallo series starts at $660 per pair. The M22 is unconventionally tall for a bookshelf model, standing 19.8"H (x 7.3"W x 8"D), and has a 1" tweeter and two 5.25" woofers. Picture a standard bookshelf speaker as the upper two-thirds, sitting atop an extra woofer. The M22 is Vortex-ported and magnetically shielded, and that extra woofer gives it a bit more weight (16 pounds each) than you might expect. The five-way binding posts are gold-plated. The M22 has long been a well-regarded, well-known performer among audiophiles, but for some time Axiom speakers had been available clad only in the usual vinyl suspects: black ash, Boston cherry, beech, and maple. 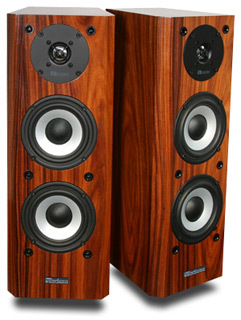 But with the introduction of the VaSSallo Real Wood Series, Axiom speakers are now available in an overwhelming number of cosmetic combinations: eight veneers (pine, walnut, oak, cherry, rosewood, maple, high-gloss black and white), six stains, six grille colors, and three finishes, along with your choice of Axiom logo in gold, chrome, or gloss black. At first, the range of choices can be paralyzing. The website, however, makes it easy to view the overall options and click on a specific combination, which is then presented in an image of how your speakers will look. If a computer-generated approximation isnt reassuring enough, Axiom offers a 7.9" x 10.5" sample in a couple of days for around $25. In the past, Ive considered it quite an accomplishment to have avoided the ubiquitous black ash as the finish on my speakers. It hasnt been easy. At the entry level, if you believe that sound counts more than looks (I do, and the makers of entry-level gear unfortunately seem to agree), you get the feeling that black ash outnumbers other options by three or four to one. The only finish I can remember wishing for, on speakers I couldnt afford, was rosewood. Its a rich, beautifully toned wood with a hint of red that makes exquisite bodies for acoustic guitars. If you dont play an instrument, your speakers might be the closest you get to experiencing the qualities of wood -- even if all that wood does is cover medium-density fiberboard. I must have expensive taste, because for rosewood, Axiom charges an additional 15% (even for a sample). After several sessions of experimenting with this wood and that stain, I finally settled on the natural rosewood veneer (walnut looked pretty good too, for $100 less) finished with a coat of transparent semigloss. Again, it seems that expensive speakers always have a special coating that gives them the sparkle associated with the high end, a pizzazz completely inaccessible in the flat-black-ash end of the market. I asked Axiom, via e-mail, for their recommendation regarding grille color. Black is the obvious choice for catching the rosewoods grain, but they also offer charcoal, which appealed to my sense of the unusual. On my computer screen, however, there didnt seem to be much of a difference. Axiom recommended the combination of rosewood and black with chrome logo. Its understood that an Internet retailer will have excellent customer service, but its reassuring when it actually turns out to be true. In my system, the customized M22 v2s (final cost $759/pair) replaced Athena Technologies AS-B2.2s. Also in the signal chain were an NAD C325BEE integrated amplifier, a Pioneer DVD-353 DVD player connected with Monster Cable interconnects, and 9 each of Element Cable Double Run speaker cables terminated with banana plugs. Id anticipated the arrival of my VaSSallo M22 v2s as if I were being sent a handmade cello Id partially designed myself, to my taste, but had finished by experts. It was a wonderfully involving shopping experience, and the result was a pair of speakers that looked spectacular. The sumptuous rosewood and semigloss finish gave them the subtle sheen of speakers protected and enhanced by much costlier lacquer. Even the packaging signaled quality: in its carton, each speaker was protected by a black cotton slipcover. The pair came with a padded folio containing a color brochure that included a spec sheet and advice on speaker placement, cabling, and overall care. Axioms distinctive white aluminum woofers and black dustcaps look fine in full view, and with the grilles removed, more Real Wood Series rosewood was visible. I discovered that I slightly preferred listening with the grilles off, which ever so slightly enhanced the M22 v2s transparency. You cant do much better than the Athena AS-B2.2 at $249/pair, but at nearly twice the price, the standard M22 v2 ($460/pair) was a sonic step up. DAngelos Voodoo [CD, Virgin 48499] was such a watershed of neo-soul in 2000 that its driving creative force has been unable to follow it up. The recording evinces a profound understanding of the electric bass, as played by session man extraordinaire Pino Palladino, and this understanding was equaled by the capabilities and presentation of the Axiom M22 v2. Throughout Voodoo the bass lines percolated and rumbled under the surface, while the beats were accented by the sharp drum cracks of Questlove, from the Roots. The M22 was able to sustain the albums atmosphere of hazy, syrupy rhythm, as well as the sense of airiness as the voices of DAngelo, overdubbed in varying degrees of falsetto, darted in and out of the mix. Voodoos tension builds as the musicians become more desperate to release it. The M22s kept everything in balance and presented this dynamic range expansively, with powerful presence. Questlove is one of the true visionaries working in contemporary music, and his drumming on the Roots Game Theory [CD, Def Jam 7222] is the sound of a crane dropping concrete blocks onto a foundation. Whereas the mood of Voodoo was druggy, its deceptive casualness masking coiled aggression, Game Theory is a percussive, in-your-face state of the state. The M22s stayed with this disc through every thudding moment, reaching the peaks without any breakup as Questlove led the way through brawling, bludgeoning raps and pummeling choruses. Lead rapper Black Thoughts lack of subtlety and heavy touch suits this music, and this music suited the M22 v2, which responded hungrily to the rhythmic challenge with richness, full-bodied sound, and realistic believability that grabbed me by the front of my shirt. The versatile M22 v2 conveyed nuance and a broad range of tonal colors when called for -- or slammed and shouted with authority on demand. After the M22s distinguished themselves on two sonically captivating CDs, I played Craig Harris Souls Within the Veil [CD, Aquastra Music 001]. This self-released, two-disc live recording captures Harris tentet performing the trombonists score commemorating the centennial of the publication of W.E.B. DuBois book The Souls of Black Folk. The band, comprising Harris plus nine of the top jazz improvisers in the business, play this ambitious music with palpable commitment and some jaw-dropping solos. Unfortunately, my enjoyment of the disc is marred by a tizz that develops as the concert unfolds. Disc 2 is particularly irritating -- the sort of recording that sends you to other playback systems to make sure something hasnt gone wrong with your gear. Through the M22 v2 there was still some tizz, but not as much. Some of that annoying harshness was buffed away, which confirmed my impression that while the Axiom was mostly accurate, it was also a little forgiving. Even the basic, vinyl-clad M22 v2 retails for nearly twice as much as the Athena AS-B2.2, and sounded it. Granted, the Athena is a tremendous bargain, and since its cabinet is a bit larger than normal for a two-way, its surprisingly extended in the bass and agreeably softspoken. What the Athena isnt is neutral -- it tips the coloration scale away from brightness and toward woolly warmth. However, the AS-B2.2 offers a pleasantly smooth listening experience. The M22 v2 gave me the sense that the music I heard was what the musicians intended. Its a bit too short for a floorstander, but I found the pair of them almost too high when I sat them up on 20" stands. Youll have to take great care to make sure your listening position and the placements of the M22 v2s are in sync, because one thing these long boxes did was lengthen the soundstage. The improved dimensionality was undeniable -- as if the musicians were up on a riser in my room, rather than sitting across from me. The question to ask is this: Aside from the audible benefits, is cabinet customization worth the extra cost -- in my case, roughly 60% percent over the basic model? I can only say that, having gone through the selection process, the ordering, and the waiting, Ive never been so emotionally invested in a piece of gear in my life. Im proud of my speakers -- my real-wood VaSSallo M22 v2s have gone a long way toward making me forget about other dubious, superficial upgrades that might be out there. In the quest for satisfaction, relieving the madness of upgradeitis probably pays for itself. For Axiom Audios VaSSallo M22 v2s, following the flow of recorded music was a piece of cake. Their naturalness eliminated all the artificial overcompensation that is all too common in reasonably priced equipment. Midbass, upper-bass, and midrange notes were precisely articulated, and what the M22 v2 lacked in low bass (as will any bookshelf monitor) it made up in crispness and clarity in the treble. In combination with the M22s coherent low end, the crystalline highs of its titanium tweeter supported the musics overall architecture, and established the drama and scale essential to an involving musical experience. The M22 v2s marvelously warm presentation was inviting -- it was the sort of speaker that urged me to think of new things to listen to through it. And with the ability to customize their appearance with real-wood veneers and finishes to match any style and taste, Axiom speakers now look like a million bucks.